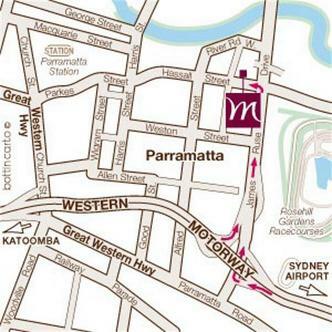 Mercure Hotel Parramatta is adjacent to Rosehill Gardens Racecourse and only 1km from Parramatta city centre. The hotel has recently undergone a major refurbishment and features 164 contemporary rooms, equipped with cable television on LCD screens and w. ireless broadband Internet connection. Facilities include a restaurant, outdoor swimming pool, spa, tennis court and undercover parking.